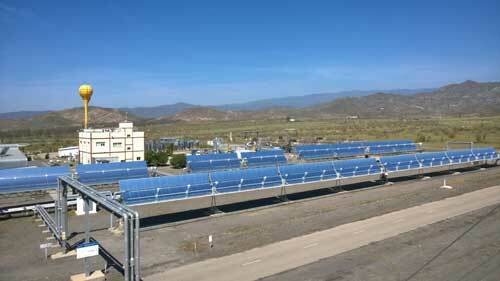 (Nanowerk News) Led by VTT Technical Research Centre of Finland, the COMBO-CFB project has developed a new innovative concept to increase solar energy production in the energy system. According to this research, the concept can reduce fuel consumption and emissions stressing the climate by more than 33 per cent. The concept is based on the combination of concentrated solar power (CSP) technology and a traditional power plant process into a hybrid plant which produces electricity on the basis of consumption. If part of the fuel used by a power plant is replaced with solar energy, power plant emissions will be reduced. This is also required in order to meet the emission reduction targets. The COMBO-CFB project – Combination of concentrated solar power (CSP) with circulating fluidized bed (CFB) power plants – examined how various types of hybrid plant solutions can produce power flexibly according to demand, without the need for energy storage. The project analysed and compared different hybrid plant concepts. The concept in which steam generated by a solar field was fed directly into the power plant's high-pressure turbine brought a reduction in emissions and fuel consumption which, at best, exceeded 33 per cent. Furthermore, a reasonable dimensioning of the hybrid plant and process optimisation can bring efficiency benefits as compared to the use of separate power production methods. In the aforementioned case, the plant's net efficiency improved by 0.8 per cent. In addition to positive climate effects, good hybrid plant planning can also bring financial benefits since part of the power plant components are shared by two power production methods. The COMBO-CFB project applied the Finnish project partners' high-level expertise in boiler technology. In a hybrid power plant, solar energy production which varies with weather is balanced by using a steam boiler. The production concepts developed through this project will expand the application possibilities of the CSP technology. The dynamic nature of a hybrid process poses challenges to production system design and operation, particularly when the share of solar energy in power production is high. The COMBO-CFB project examined these challenges by using the Apros software designed for dynamic modelling, as well as through combustion tests conducted by using VTT's pilot equipment in Jyväskylä, Finland. This dynamic assessment at the plant design stage proved extremely important since it enables designers to take account of factors such as those affecting the lifetime of components. The concept in which part of the feedwater preheating is substituted with solar steam can be implemented in the present power plants, but compared to the aforementioned high-pressure turbine concept, the benefits are considerably smaller due to the smaller share of solar energy. The functioning of a hybrid process can be generally improved by attaching to it an advanced predictive control system and a short-term solar irradiance forecast. In the COMBO-CFB project, Vaisala developed a cloud camera which identifies cloud movements in the sky in order to increase the accuracy of the solar irradiance forecast for the area. The implementation of the CSP technology in power production is reasonable in areas with an abundance of sunlight. In Europe, this means, for example, the countries bordering the Mediterranean. However, this technology can also be implemented in areas with less sunlight by using hybrid power plants in which solar power is supported by another form of energy. For the time being, Finland is not applying this technology, whereas Denmark is already using a CSP-bio hybrid plant to produce district heating. Finland has unique, internationally competitive expertise that it can provide to the hybrid power plant export markets. The COMBO-CFB project's partner network can support the commercialisation of such hybrid plants. The Finnish project partners' areas of expertise include boiler and control technology, process modelling and weather measurement and forecasting. VTT Technical Research Centre of Finland, the University of Oulu, Amec Foster Wheeler, Vaisala, Telog, Pöyry, Finnish Energy and the Federation of Finnish Technology Industries. Concentrated solar power is a renewable energy technology that can be used to produce both electricity and heat. Other applications include for example desalination. The CSP technology involves the concentration of energy contained by sunlight by using mirrors. This energy is converted into heat that runs the turbine, similarly to traditional power plants. Unlike in traditional power plants, however, the power production varies depending on the irradiance level. Already today, the CSP technology can be implemented to produce electricity in accordance with consumption by uncoupling solar heat collection from power production by use of a heat storage unit. However, such storage solutions continue to be expensive, and there is still no technically reasonable storage solution for all CSP technologies. For this reason, hybrid plants are an important development step towards flexibly adjustable renewable energy production.